Experience our cuisine which focuses on fresh, regional and seasonal ingredients. We use many traditional recipies and like to adapt them in a creative way. Discover our wine celler with more than 100 different wines. 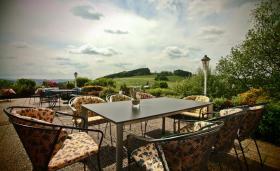 A table reservation or the booking of a menu/ offer is in the "Eickhoffs Landgasthof" via GlobalGuest always for free you as a guest!